Nice contrast. Dark blue rain clouds. White, very dry and thick bush. Red leaves and grasses on the ground. 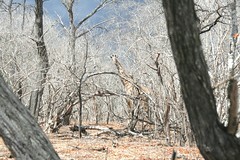 And a Giraffe - a Masai x Reticulated Giraffe hybrid - walking in its graceful slow pace through the thickets.